The pituitary gland, located at the base of the brain, is a small organ about the size of an acorn. The pituitary gland is sometimes referred to as the "master gland" because it releases substances which control the basic functions of growth, metabolism, and reproduction.The pituitary gland is divided into two parts calledlobes. These are referred to as the anterior and posterior lobes. Each lobe releases special substances, or hormones which control basic activities within the body. A tumor in the pituitary gland causes symptoms by either releasing too much of a hormone or by pressing on the gland causing it to release too little hormone. The symptoms one experiences from the pituitary tumor are often determined by the type of tumor. A tumor that secretes hormones produces symptoms by releasing too much of the hormone. Some tumors cause the gland to stop releasing enough hormones. In this case symptoms arise from lack of hormones. A pituitary tumor may also cause symptoms by growing and pressing on the structures, like the nerves to the eyes, surrounding the gland. Elevated levels of prolactin may cause secretion of breast fluids and decreased sexual drive in men and women. It may also cause irregular or absent menstrual periods in women, and difficulty in having an erection or infertility in men. 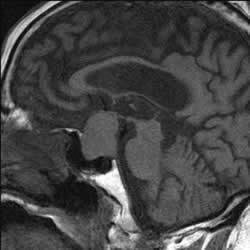 This is called a PROLACTINOMA. Typically these tumors can be treatd with medication alone (bromocriptine). Only one type of pituitary tumor can be successfully treated with drugs. This type of tumor secretes a hormone called prolactin. Tumors that secrete prolactin are calledprolactinomas. Prolactinomas can often by controlled by a drug called bromocriptine.This drug will most often cause a reduction in the size of the tumor and at the same time cause a decrease in an abnormally high prolactin level in the blood. Although Bromocriptine may control the tumor, it may not cure it. Treatment with Bromocriptine must often be continued for many years at reduced levels. More recently, chemotherapies, such as Temozolomide (Temodar) and Bavacizumab (Avastin), have shown a benefit to tumor control and symptoms in some patients. For more information, contact your doctor. Additional information is available by clicking on Medical Treatment for Brain Tumors and Clinical Trials. Radiation therapy, given under the direction of specialist called a Radiotherapist, is most effective when the size of the tumor has been reduced by surgery. The greater the amount of tumor at the time of radiation therapy, the less effective the treatment will be. Radiation therapy usually requires a series of treatments lasting a few minutes each day for four to six weeks. In most cases, the treatment is painless and can be done on an outpatient basis. Radiation treatments are generally begun a few weeks or months after surgery to allow time for the incisions from surgery to heal. The ability of the gland to produce hormones often decreases slowly after radiation therapy. Twenty (20) percent of patients who have normal pituitary function early after the completion of radiation therapy will require hormone replacement after two years. This figure rises to 50 percent after five years. Surgery is the preferred method of treatment for most pituitary tumors. Two types of operations are done for the removal of pituitary tumors. One, called a craniotomy, is directed through the skull above the eye. The other, called a transsphenoidal operation, is directed through the nose. The craniotomy operation involves making an incision on the scalp near the top of the head. A piece of bone is then lifted out and the coverings over the brain are opened. The lower part of the brain is gently lifted to expose and remove the tumor. The piece of bone is then replaced and the scalp is closed with stitches or staples. In most cases, the incision on the head can be placed so that the scar is hidden by the hair. This type of operation is not often needed for a pituitary tumor, but it is sometimes necessary if the tumor is very large and/or it cannot be reached through the transphenodal operation.